For over a decade, staff in our Population Sustainability team has been working with our partners to study the jaguar in the southwestern Amazon of Peru. The Amazon rainforest is the largest remaining habitat for the species, and our data are crucial for conservation planning in the region. Using GPS telemetry and camera traps, we have collected detailed information on the population status and ecology of jaguars in different land-use types ranging from protected areas to logging concessions. 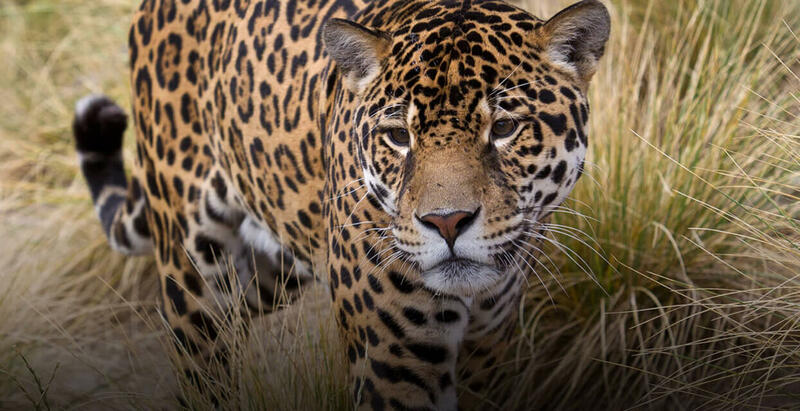 We have shown that logging concessions protect important jaguar populations and that the Southwestern Amazon supports one of the highest jaguar densities reported. Our study is one of the first to collect detailed data on home range size and diet of jaguars in the Amazon. The Association of Zoos and Aquariums (AZA) maintains a Species Survival Plan (SSP) for jaguars that is based at San Diego Zoo Global. A staff member in our Life Sciences Department serves as North American Regional Studbook keeper and SSP Coordinator for jaguars. The status of the jaguar under this plan was recently upgraded and we are now designing a field strategy to begin applying zoo resources to influence policy decisions in support of jaguar conservation in North and Central America. Through a grant from the AZA Conservation Endowment Fund and contributions from numerous zoos participating in the Jaguar SSP, San Diego Zoo Global’s Department of Life Sciences has been involved in camera trapping to conduct jaguar population density estimates in Yucatan, Mexico, since 2004. This effort will greatly increase our understanding of jaguar habitat use throughout their range.